Now that my daughter is getting older, games are becoming one of her favorite things. It’s fun to watch her wheels turning as she figures out the rules, experiments with strategy and plays with competitiveness. So we decided to make last Friday night Family Game Night, complete with a playful cookie snack. #GameNightIn #CollectiveBias. We started off the game night with a friendly game of Jenga®. 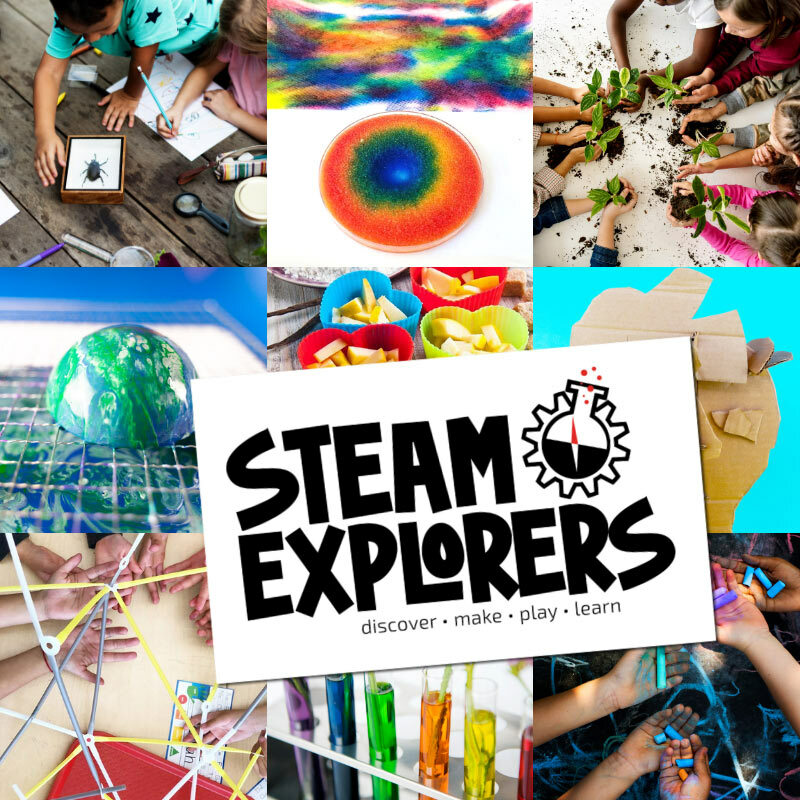 Because building play is a household favorite (check out our Ice Palace Building or Tinkering Trees). And plus it puts a good spin on the evening because no one can avoid giggling when the Jenga® tower falls! 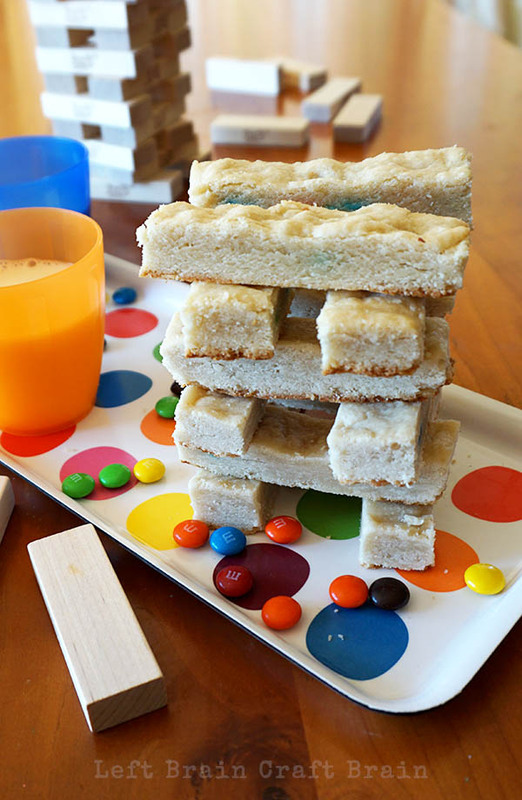 And these cookie bars make for great building play, too! 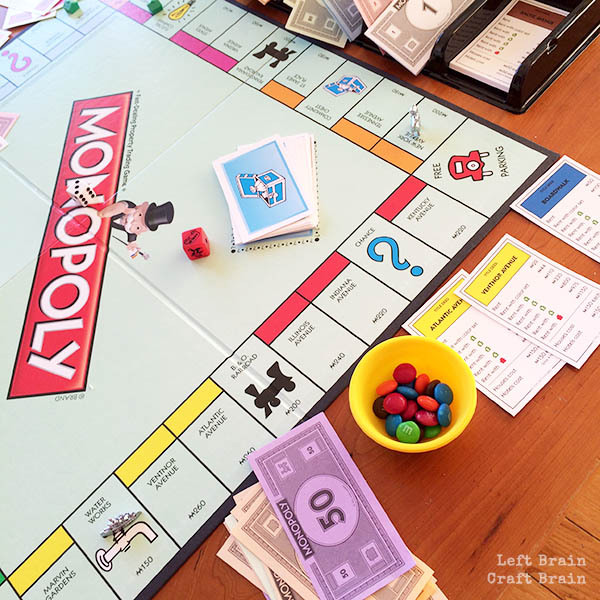 It’s was my daughter’s first time playing Monopoly® and it was awesome. Don’t you think sharing things from your childhood with your children is one of the best parts of parenting? I definitely do. Servings: Makes about 16 large cookies. Make your superfine sugar by pulsing sugar in your food processor for 10-15 seconds. Mix your dry ingredients (flour, sugar & salt) in a standing mixer. Or in a large mixing bowl if you’re doing it by hand. Cut each stick of butter into 8-10 pieces. Then, while mixing on low, add the butter 1 piece at a time. Mix until butter is incorporated and mixture is crumbly. This takes about a minute. Add the vanilla and cream cheese and continue to mix for about a minute. Dough will still seem a little crumbly. Knead the dough by hand to pull together the crumbles and make sure the cream cheese is evenly distributed. Divide the dough in quarters and refrigerate until ready to bake. You need two loaf pans for this recipe. You can use one 9×13, but the cookies tend to get a little overdone on the edges by the time the center is cooked. Grease your pans, then cut two pieces of parchment the size of the bottom of a loaf pan. Place parchment in the bottom of pan, grease and then flour. Take 1/4 of the dough and flatten to 1/3″ thickness in the bottom of the pan. It can help to roll it out a bit ahead of time. 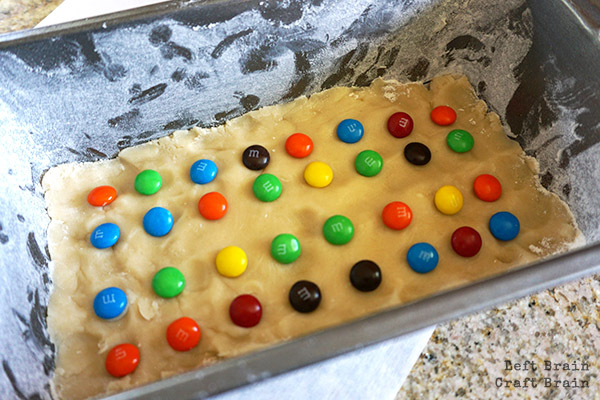 Place M&M’s® on dough in rows leaving space between to “hide” them when you cut the cooked bars. Then flatten another 1/4 of dough and cover the bottom layer. Make sure dough is as smooth as possible and reaches all of the corners. Bake for 20-24 minutes, rotating the pan after 10 minutes. Do not over bake the cookies, they should be en brown at the edges but still pale in the center. Cool pan completely on a wire rack before removing from the pan. Once cool, gently remove cookie from pan and peel off parchment. Cut off browned edges and slice into 8 bars. Want to Up the Ante on the Cookie Bars? Cover the cookies in a layer of royal icing. They’re not as cute as the plain bars, but they are killer. Really yummy. Simply place the cut bars on a wire rack placed inside a cookie sheet and pour the icing over the cookies. You can use a spatula to make sure all of the edges are covered. In a large mixing bowl or a stand mixer bowl combine powdered sugar and meringue powder. Mix on low (with splash screen on!) for about 30 seconds to break up any clumps. Then add water and mix on medium for about 6-8 minutes, stopping in the middle to scrape the sides of the bowl. The icing should look thick, like paste. 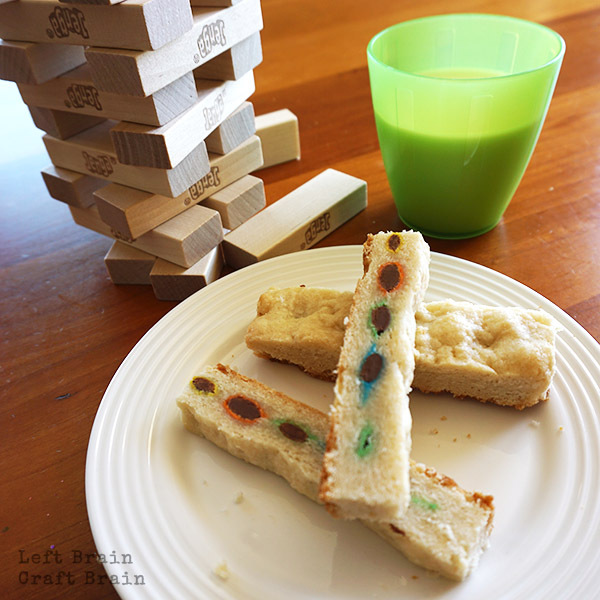 Now add your gel food color until you reach a pale, Jenga block sort of color. Remember that colors will deepen after a few hours so you can stop adding color before you get that perfect shade. Mix on medium for another 3-4 minutes until the icing has a lighter, whipped consistency. Finally do 10 Second Test. To conduct the 10 Second Test, pick up a little icing on a spoon and pour it back into the container. Slowly you will see the drizzle settle into the bowl of icing so that the surface is smooth and you can’t see where the drizzle was anymore. You want to add enough water so that the drizzle disappears in about 10 seconds. If your icing fails, add a little more water (a bit at a time) until it passes the test. If it takes longer than that, it’ll be too thick to spread. Less than that and it’s too runny. I got everything I needed for #GameNightIn at Walmart. 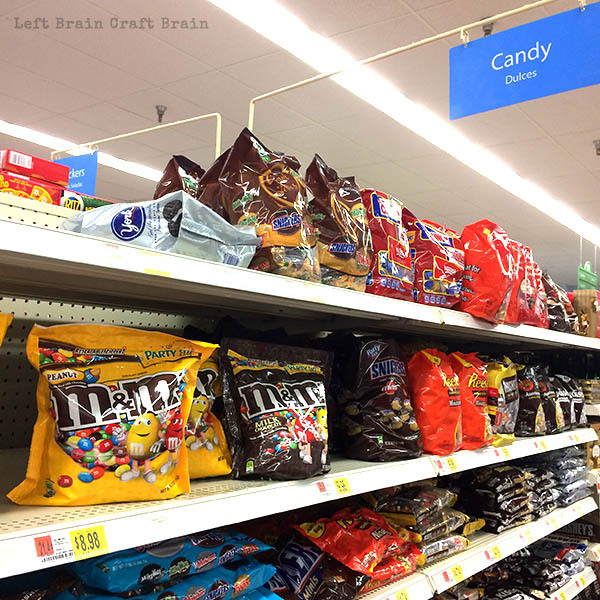 Cheap :) They’ve even got a coupon for $1.00 off M&M’s® just waiting for some cookie bars to be made. I may write a blog about kid’s activities, but cookies are one of my things. 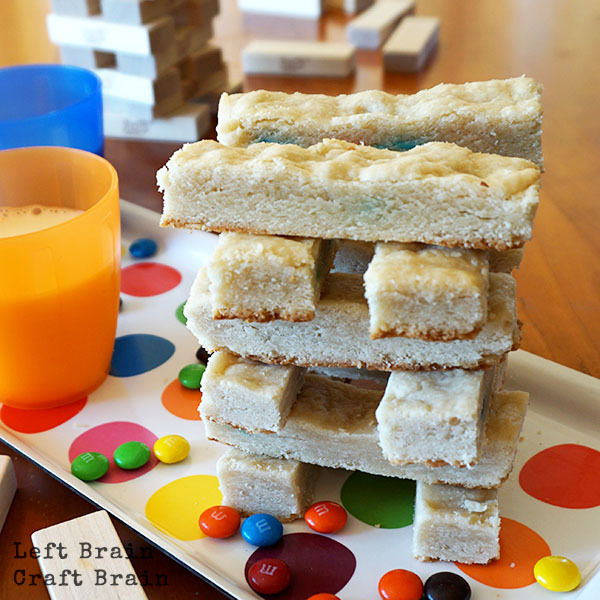 Oh and one of my daughter’s things :) Come follow me on Pinterest for more fun cookie ideas. 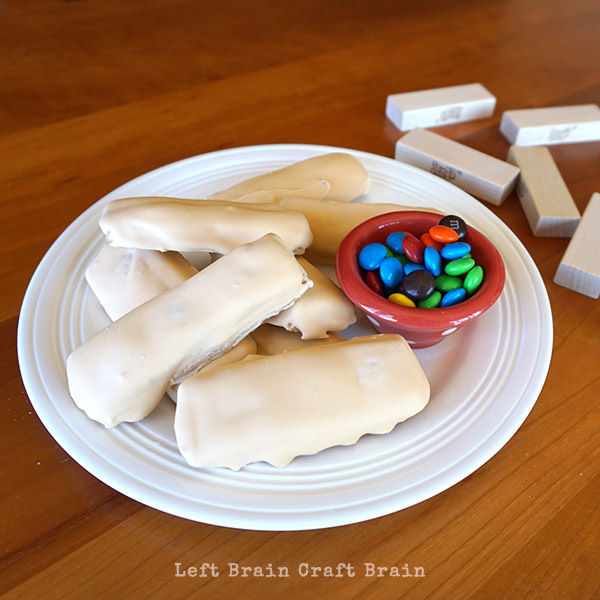 Follow Anne @ Left Brain Craft Brain’s board Cookie Creativity on Pinterest.